We all know this by now: the 2015 in Back to the Future II didn’t happen in real life. We failed. But! We can totally make things right by changing the past, as in re-editing Back to the Future II to include things that actually happened in the year 2015. It actually works out quite well, as PistolShrimps shows, instead of a Jaws shark hologram eating Marty, it would be a Jurassic World dinosaur. And instead of Biff being the most powerful buffoon in the world, it would be... Donald Trump. 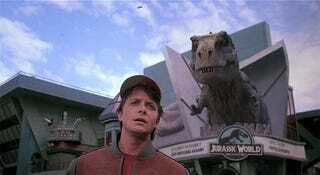 There needs to be an entire movie of Back to the ‘real’ Future.